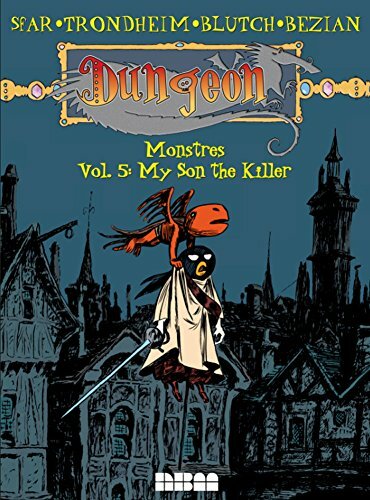 DUNGEON Monstres, Vol.5 My Son the Killer is published by NBM and translated from French.The Dungeon comic series is the brainchild of Joann Sfar and Lewis Trondheim and focuses on anthropomorphic fantasy characters ,set in a magical world. For this volume, there are 2 stories -- My Son the Killer and Soldiers of Honor. My Son the Killer narrates the story of Marvin the dragon, as an adolescent, and how he and his mum became the bodyguards of the Keeper -- after foiling an assassination attempt. The story is quite humorous as Marvin took on his duty as a bodyguard zealously. The guest artist for this story is Blutch and his artwork is really nice, using brush strokes for his line art. I also liked the pacing of the story and how it is filled with funny moments. Soldiers of Honor has a darker story of two brothers who are soldiers. When one of them did not complete his mission, the other brother has to be sentenced to death -- to be killed by his own brother in combat. The story is in a monologue format, narrated by one of the brother. The story is well crafted with macabre moments and humor. The art style for the second story is completely different, with loose frenetic line art done in pen and ink. The panels are well-thought-out to bring out the bleak nature of this story. It’s always a delight to read them. And I only wished that the publisher will publish the comics in a much bigger format to do justice to the artworks. In the meantime, I can only wait for the next book in the series to be published. -You can see some of the preview here.